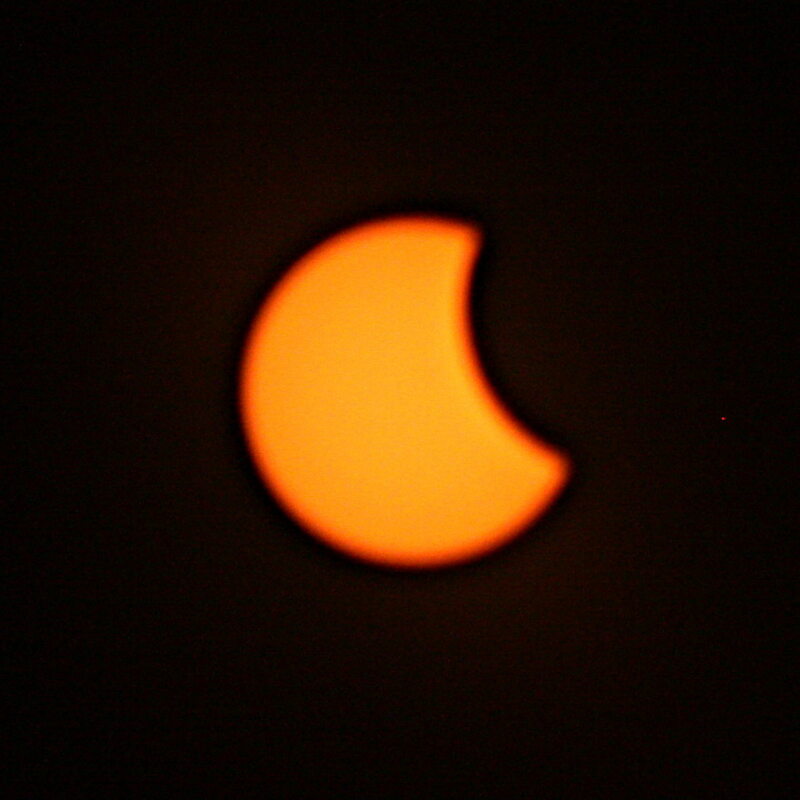 That was my only solar eclipse experience until now (I didn’t pay attention to the eclipse on 1979 though I guess some dimming would have been visible where I was). Ten days before the eclipse the long range weather forecast showed thunderstorms. And my cousins who lived there started complaining about incessant rain. 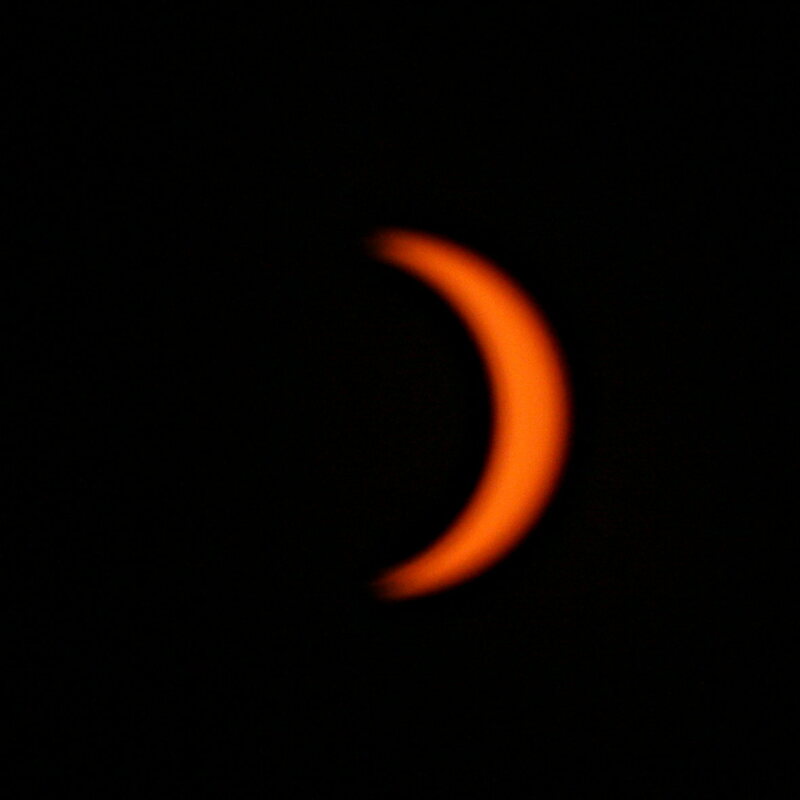 I arrived in the valley late Friday night (before the Monday eclipse), and luckily my second order of eclipse glasses had preceded me. It had also stopped raining. Whew. The partial eclipse was scheduled to start at 1:06PM so around quarter past we went out to the front porch and could see (through the eclipse glasses) that the sun was just being nicked by the moon. It took me a while to get my camera set up (it turns out that a normal tripod doesn’t work very well when taking a picture of something near the zenith. The tripod prevents the camera from pointing straight up. I hadn’t thought of that. If I angled the tripod legs enough for the camera to point up, then the tripod overbalanced). 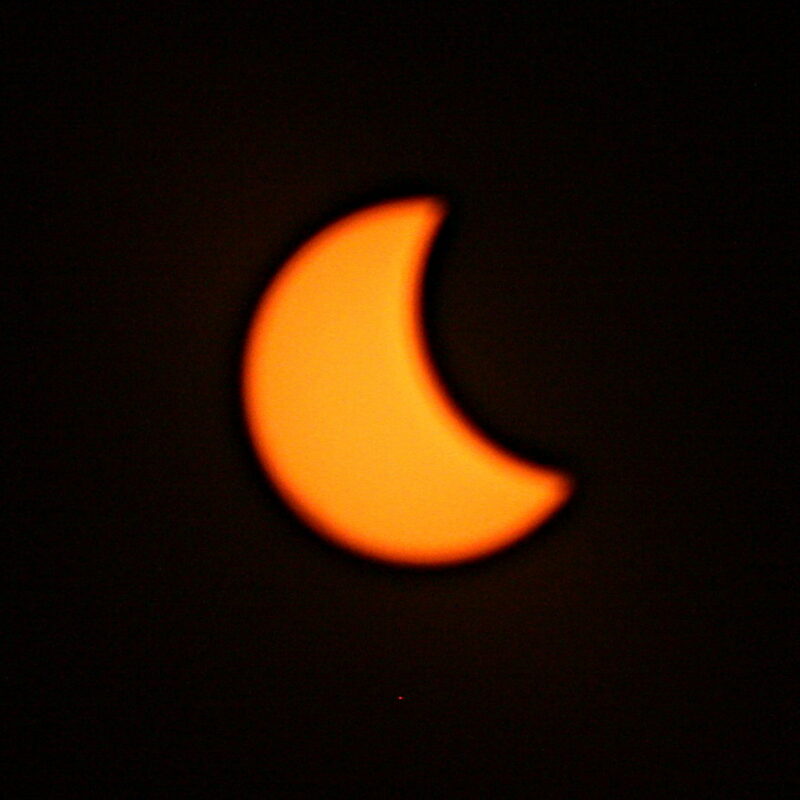 Now it takes the moon a good while to cover the sun, almost an hour and a half from the start to totality. You get rather bored staring at an object which doesn’t change noticeably… so my brother organized a game of cards, and after every hand was completed (every 10 minutes or so) we’d all get up and take a look. That worked pretty well. 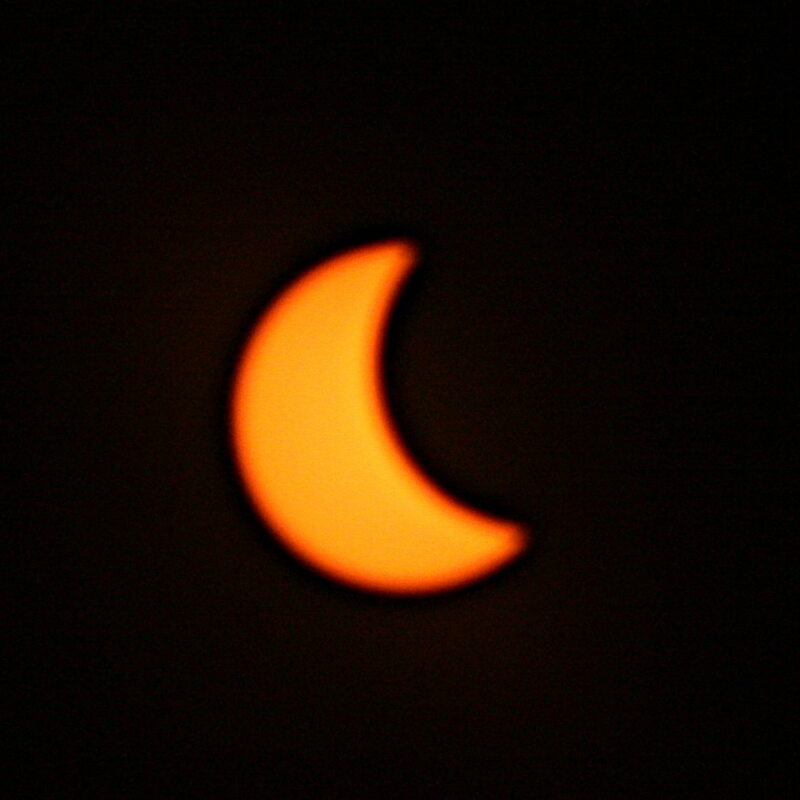 As far as the naked eye could tell there was surprisingly little dimming until just before totality. There are several reasons for this, the first is simply that the eye isn’t designed to measure brightness, it is designed to see things and to adjust so that it can see no matter what the level of light. So when it gets darker the pupils automatically get wider and you don’t notice any change. The second is that the eye reacts to light levels in a logarithmic fashion, so a diminution by a factor of two makes just a slight change in what we see. 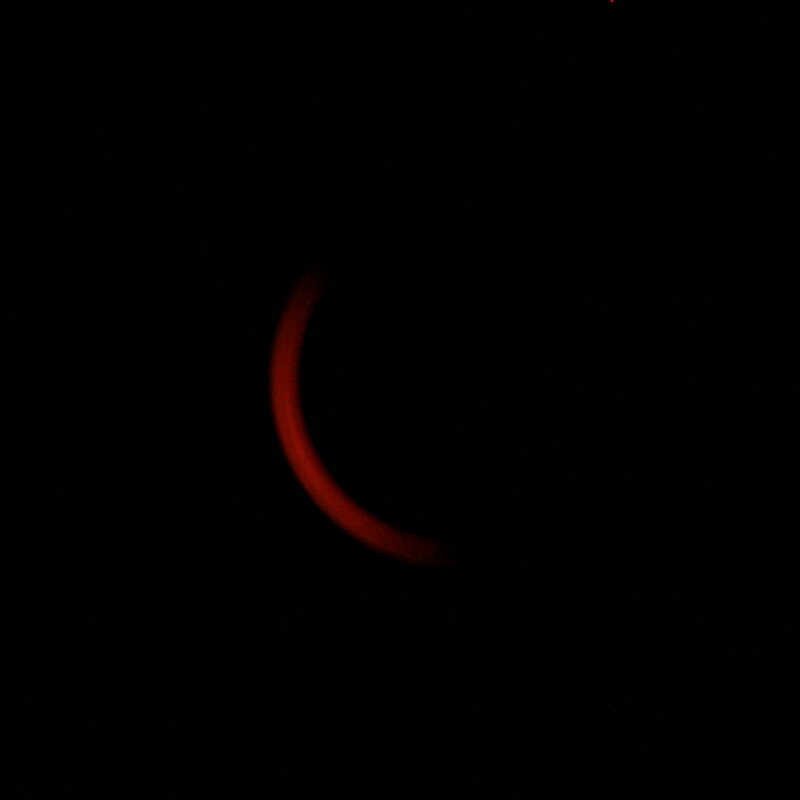 But a few tens of seconds before totality happened the light started changing significantly, rapidly and noticeably. It got much darker. Not black, but a dim twilight. A sunset light spread around the horizon (or such of it that wasn’t hidden by trees). A planet was visible up near the sun. Not dark enough for my eye to see stars though. 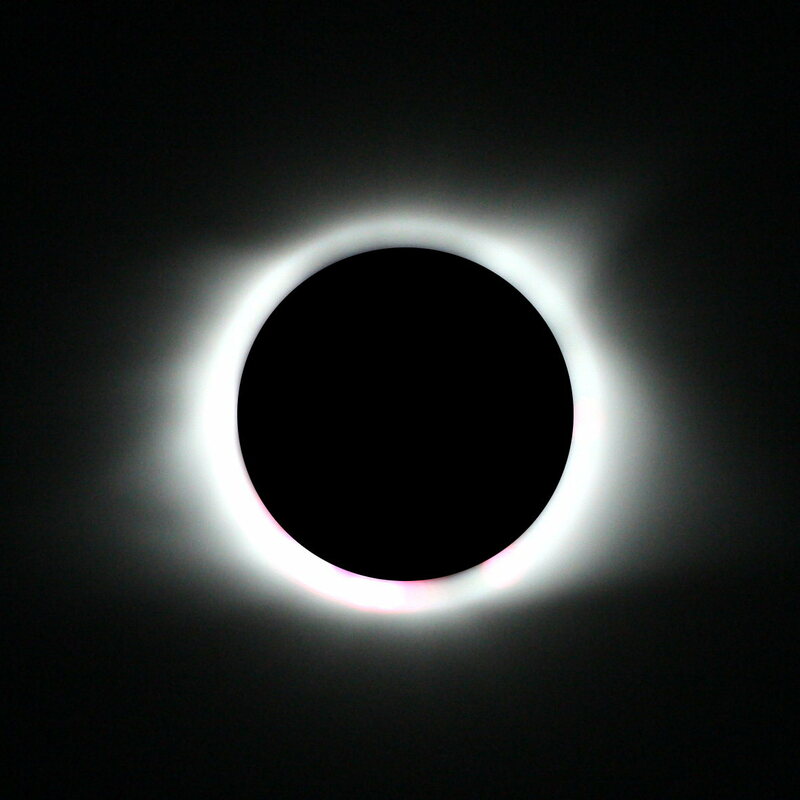 The difference between 99% coverage and totality was extreme and worth seeing. I had assumed that it would just be more of what I’d seen as a child with 98% coverage. It was not. It was a completely different thing. Above us all hung a black sun. Timelapse video around totality (sped up too much. next eclipse I’ll know better). Looking across Sautee Valley. Another timelapse video around totality, sped up even more. This one from the top of Lynch Mountain looking toward Tray Mountain. 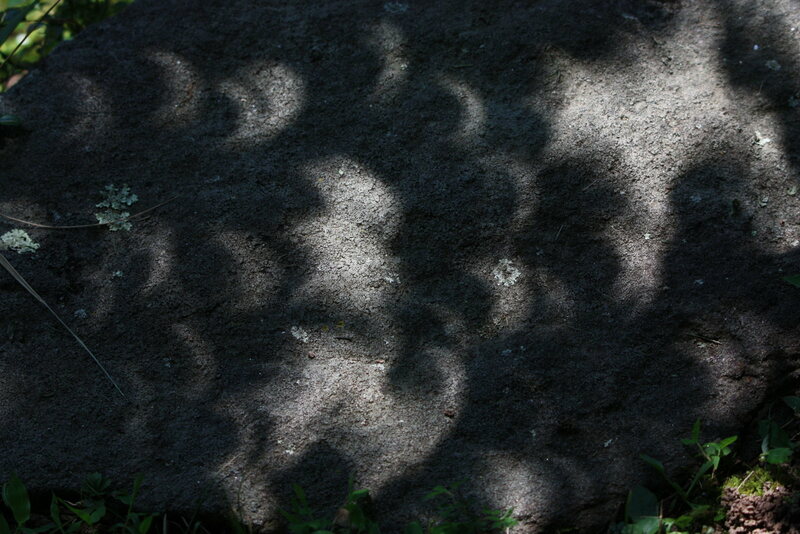 About 20 minutes before totality I noticed that the holes between tree leaves had started acting like pinhole cameras (they might have done so earlier, that was just when I noticed it). About 6 minutes before totality I started making a time lapse video of this effect. 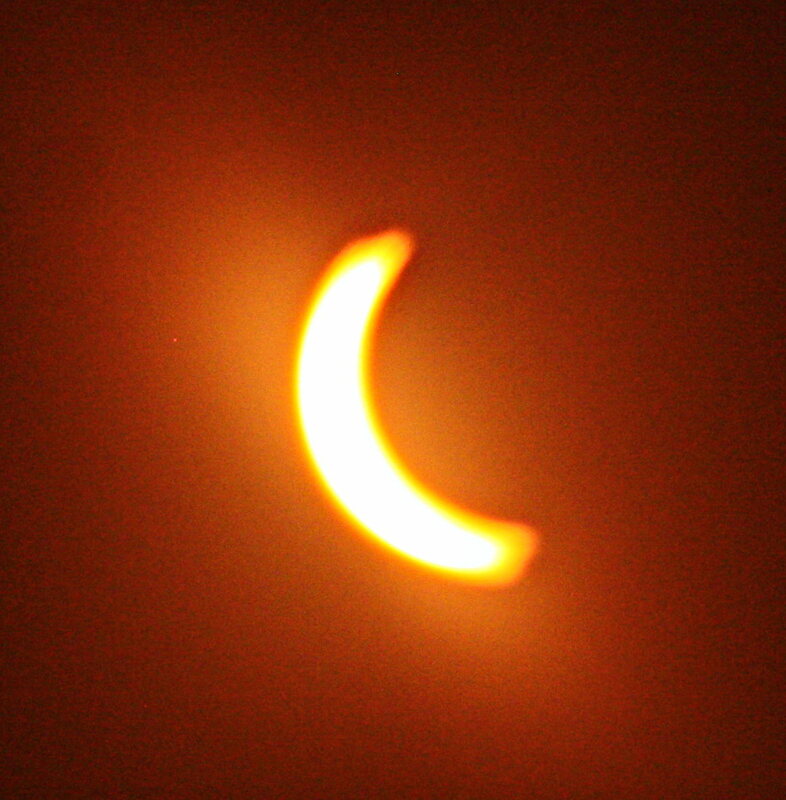 The crescents go through totality and come out the other side (sped up by a factor of 30). 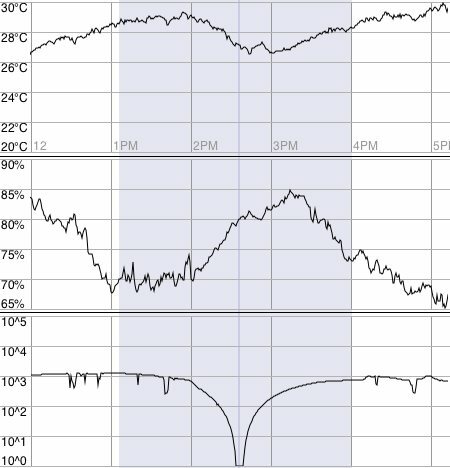 I set my cellphone (Samsung Galaxy S4) to logging temperature, relative humidity and luminosity, taking samples every 15 seconds starting (roughly) a day before the eclipse and ending a day after. I am graphing log10 of the luminosity, as I think that is more in keeping with what the eye sees. 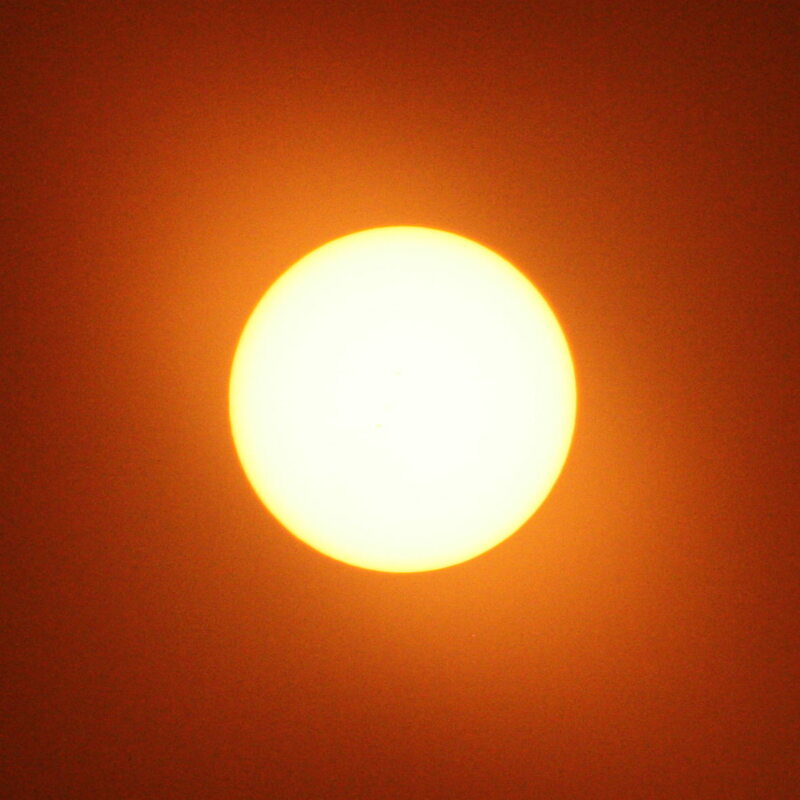 (The abrupt spikes in luminosity may reflect brief moments when the sun shone on the device. I thought it was in a well shaded spot but since the spikes are at the same time on different days I suspect there were a few moments when it was in full sun. Temperature was also affected as might be expected). The light blue region is the time of partial eclipse, the darker blue line in the center is the time of totality. 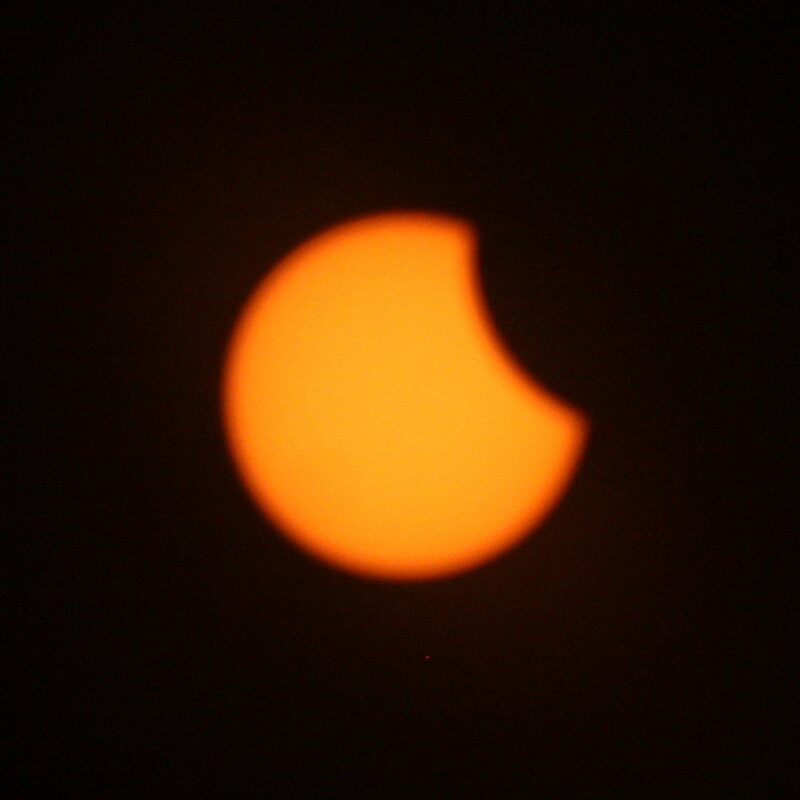 The luminosity drops to 0 with totality (at least with the inexact sensor I had). The temperature also dropped during the eclipse, but only by about 2~3°C, a short thunderstorm the next day at about the same time caused a sharper and more substantial temperature drop. The relative humidity spiked up, as you’d expect with a temperature drop. The graph below is the same thing, only expanded to show only the ~6 hours around the eclipse. Interestingly the temperature continues to drop after totality. Rather to my surprise luminosity goes to 0 about a minute before totality, 2:34:40PM, and continues there for a minute and a half afterward, 2:39:11PM. This is probably insensitivity in my sensor. This entry was posted on September 4, 2017 at 5:38 pm and is filed under nature. You can follow any responses to this entry through the RSS 2.0 feed. You can leave a response, or trackback from your own site.